amasc aka Anne says..."Roller Cops"
I've been living in India for five years now so did not know about the roller blading Policeman. 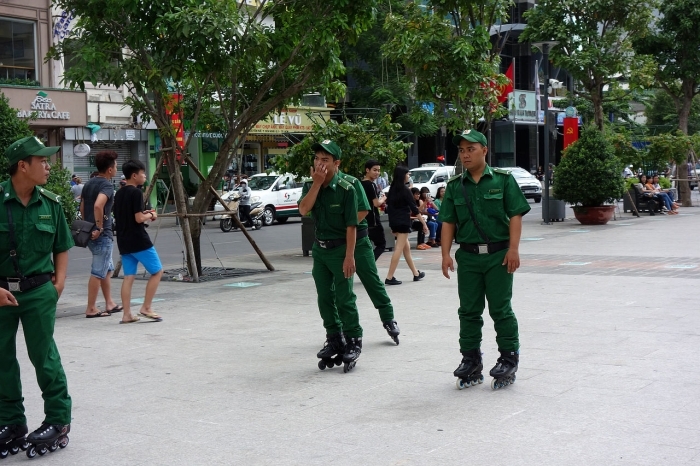 Saigon is looking very modern these days, I hope some of the old buildings remain amongst the modernity. Anne, thank you for your comment. 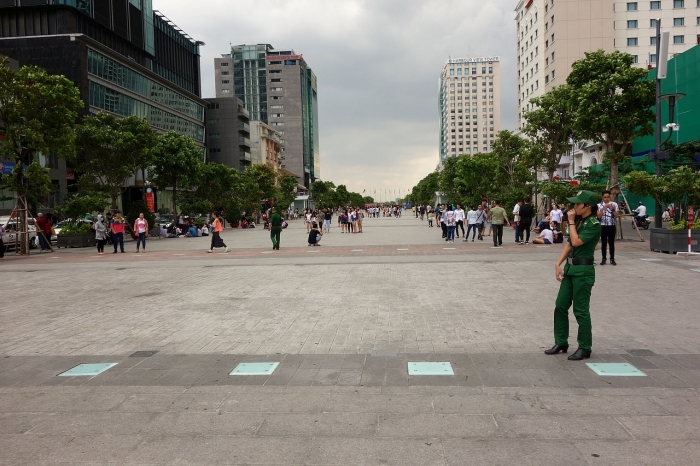 They basically flattened whole Hguyen Hue street from the People's committee building to the Saigon river. Water fountain at Nguyen Hue and Le Roy street has gone, too. Then they got huge pedestrian area but it has not been fully utilized yet. City has limited the use of pedestrian area. There are not enough benches for the peolpe to rest and some of them sit on the road surface directly. People come to see here because it is something new. City should rethink how to vitalize this area more to attaract more people and foreigners. I will put another entry to show detail of the Hguyen Hue street. Unfortunately, there are more high-rise building being constructed and planned at the center of Saigon. There are several large urban development planned at Saigon's suburban area. I wonder if all these buildings will be ever occupied. Some historical buildings have been demolished by these planning. Here is a good site showing old Saigon buildings. My recent interested area is Ba Son shipyard area. This is a good area to be preserved and refurbished as a new tourist destination as well as its water front area. Thank you, some very interesting reading there. I have friends who used to live on Nguyen Hue and left Saigon just as the redevelopment started. On a recent return visit they told me that it was looking very different, but I had no idea just how different. I think I should make a quick return visit before it all becomes unrecognisable.